The old-but-new quilt -- finished at last! Many, many, many years ago I made 35 log cabin blocks for a quilt that never got put together. I'm not sure when this happened but I think it was after the Bicentennial, because there are some red-white-and-blue fabrics in there that look suspiciously commemorative. The blocks have sat in boxes for decades waiting for something to happen, and finally they called my bluff. I started my first quilt when I was still in high school, a long time ago. It was before anybody else did that sort of thing, and there were no books or workshops to teach the basics. That didn't stop me, since I knew how to sew (garments) and figured how hard could it be to sew a quilt. In fact, much easier than sewing a blouse, because the quilt just had to lie flat rather than fit a body. The combination of supreme confidence and technical ignorance can turn out good in some ways and bad in others. But if you ever do achieve technical proficiency, it can be really embarrassing to look back at your early efforts and realize how pathetic they were. If a quilt has been sewed together and quilted you at least are spared the knowledge of how the blocks were cut and the seam allowances pressed, but if you return to a work in progress every dumb thing you did is still there on display. In fact, this quilt could be a how-not-to-do-it tutorial all by itself. I foundation-pieced the blocks instead of just sewing the logs together, and was sloppy about it, so some of the seam allowances were dangerously narrow. But not the ones between blocks, some of which were an inch wide. And not the ones that left visible dark lines because the bottom darker fabric was wider than the light fabric that was supposed to cover it (as in the pink checked log). Then there was the color choice. This was the most embarrassing part of all, because I've always prided myself on color sense. Apparently that pride was misplaced. The quilt was supposed to be a Straight Furrows design with dark and light rows, but my "lights" included a lot of mediums, and since I used a lot of big prints there were "holes" of light color in the dark pieces, and vice versa. I had violated my (now) rule of not mixing solids and prints, except in very deliberate special cases. If you stand on the other side of the room you can see the dark/light pattern, and it's pleasant, but from up close it becomes a jumble of colors, scales and patterns. And -- what was I thinking? -- I had decided to quilt-as-you-go, and had actually made three quilt sandwiches of partial rows. With very puffy polyester batting. So when I decided to finish the damn thing once and for all, my first task was to take out a lot of quilting (fortunately it wasn't very good, so no aesthetic pain). Ripping out quilting is a lot harder with puffy batting than with flat, because it's hard to get your seam ripper in there without stabbing holes in your backing. But wonder of wonders, there were exactly enough blocks to make a rectangle, and I have sewed them all together. They are finally a quilt top, even if not the prettiest quilt top in history. What a pleasant way to close out the old year, with a project that long in progress finally complete. 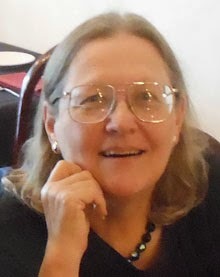 Update: linking to Nina-Marie's blog, where you can check out what other fiber artists have been up to this week. And for those who visit from Nina-Marie, this is only chapter 1 in the story of old-but-new quilts -- keep reading upwards for more! 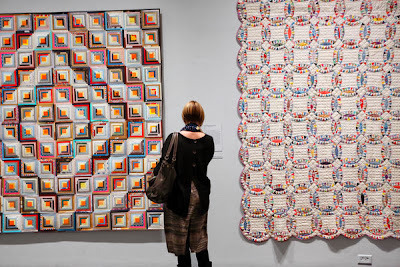 I wrote last week about a museum show of quilts by three artists that was reviewed favorably in the New York Times. Instead of making me happy it made me mad. The first two artists had the same gimmick: making quilts that look like antiques, but out of nontraditional materials (paper for one, 16mm film for the other). Without seeing the show in person, just looking at the artists' websites, I found the work pleasant if not particularly original. The third artist, though, really rattled my cage. Again, I didn't see the show, and don't even know whether these quilts were in it, but they seem to be representative of his work. He's Luke Haynes, formerly an architect, now a quiltmaker. His thing is to recycle clothing into quilts. 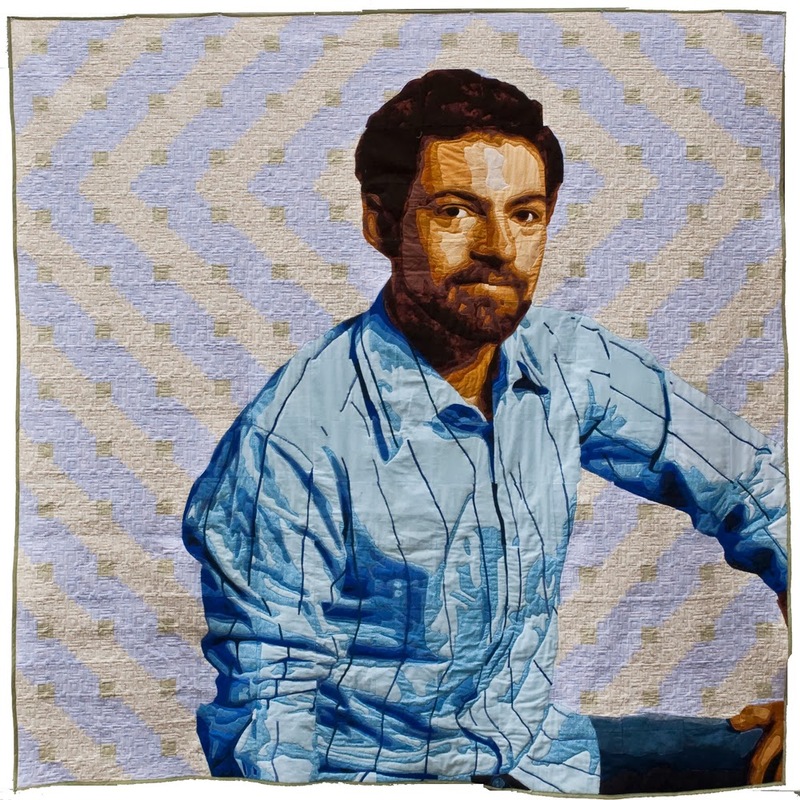 His technique is raw-edge applique, which he uses to translate photos into graphic posterized images superimposed on a background of traditional quilt patterns. Sometimes he dispenses with the quilt background to just show the image. Some of the images are homely, like the truck; others depict hiply dressed young people in poses that mirror art masterpieces of the past, against a traditional patchwork background. What's not to like in this work? The guy is very good with the Photoshop program that gives the templates, and his use of recycled clothing is certainly within the art quilt canon. But I don't see anything here that I haven't seen a hundred times before. 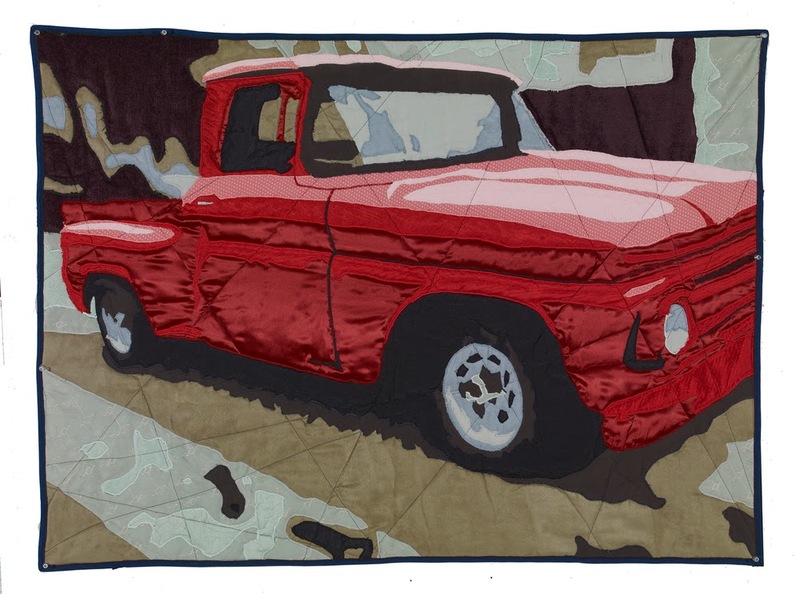 In particular, the old truck has become a cliche of contemporary quilting, right alongside the adorable grandchildren and puppies, rendered in exactly the same Photoshop posterized fashion. 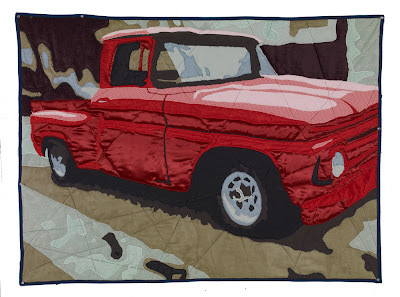 Often you'll find the old truck as the viewers' choice in the quilt show. Maybe she's just happy to have found a photogenic young hipster guy to showcase as a quilter (get it, critics? no grandmothers in sight) instead of any of the old ladies who just happen to make much better work. If so, this is no surprise; just another example of how persona often trumps substance in the Art World. My fellow blogger Vivien Zepf saw this show in person and loved it, so apparently I'm missing something by only reading the review and the artists' websites. But so far I am not amused. Tell me if I'm wrong. Yesterday's New York Times had a review of an art quilt show at the American Folk Art Museum in New York. Quilts aren't often invited to the Times art section, so I probably should have been happy to read this. But instead the whole story just pissed me off. Maybe I'm just feeling crabby today; if I'm all wrong please let me know. "... we're finally starting to recognize quilts as powerfully contemporary artworks." Two of the artists, Stephen Sollins and Sabrina Gschwandtner, have a common gimmick: they construct works that look like traditional quilts, except made from nontraditional materials. The museum even hung some of the traditional quilts next to the new ones, to make sure we get the point. 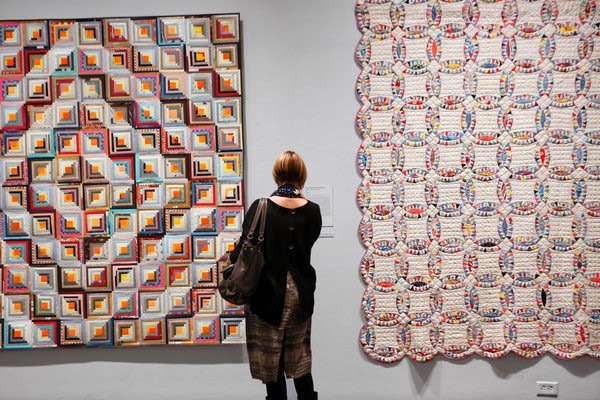 left, Stephen Sollins, "Untitled, Return to Sender after Mary Jane Smith"; right, a double wedding ring quilt by an unidentified artist. Sollins makes his "quilts" out of mailing envelopes, both paper and tyvek. Some of them are faithful replicas of antique quilts in the museum's permanent collection. He explains that mailing envelopes and quilts are both "the remains of outmoded technologies." Gschwandtner makes hers out of 16mm film that she scored when the Fashion Institute of Technology got rid of its library of documentaries on textile crafts (I hope they transferred the content to digital before they dumped the originals). 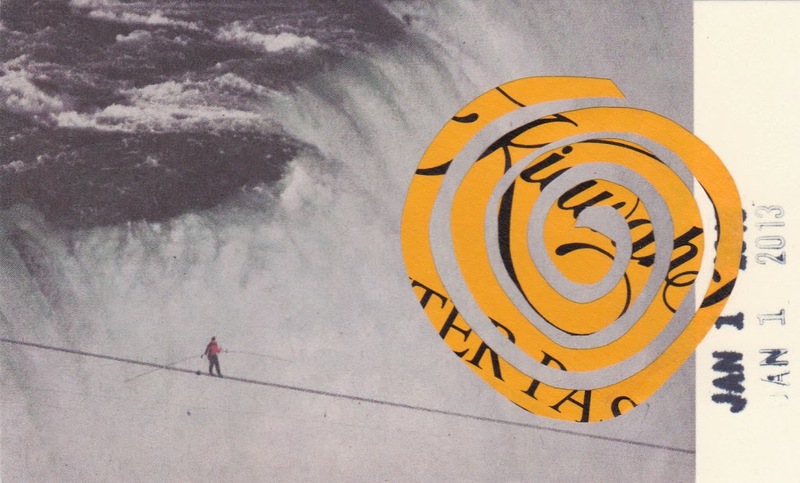 She too finds metaphorical connections between the material and the process: the cutting and splicing of film echoes the cutting and piecing of fabric, while the subjects of the films have to do with fabrics and textile making. So without having seen the exhibit in person, but spending a lot of time on the artists' websites, I am pleased but underwhelmed. 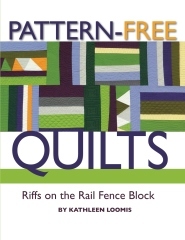 Replicating traditional patterns in materials other than fabric is hardly a new concept in the quilt world. It's been done in every Quilt National in the last 20 years, I suspect. Making patchwork out of paper is the no-brainer in this genre, so no points for originality to Mr. Sollins. Arturo Alonzo Sandoval has been making quilts out of film for decades, so not many points to Ms. Gschwandtner either. But hey, it's new to the New York art world. More next week about the third artist in the show. For decades I've been making Christmas ornaments for family and friends, and it's an integral part of my art calendar. After so many years it's always a challenge to come up with an idea that's a bit different from what I've done in the past, and then actually making the ornaments occupies a fair chunk of time in the fall. (Read about some of my past adventures here.) The rules are simple: each ornament has the initial or full name of the recipient, plus the year. This year I was inspired by a piece of fabric covered with text that my sister gave me a long time ago. She used it for a while as a curtain, but after she moved it decided to come live with me. I used it for a quilt (now traveling in the SAQA Text Messages show) and then I used some of the leftover bits for another quilt. In making that second quilt I enjoyed incorporating tiny, tiny bits of fabric -- sometimes only one letter -- into my compositions, working with a tweezer to place the bits under the needle as I sewed. Although my objective in that piece was to fragment the text into illegibility, I realized that I could go the other way and piece the fragments into words, in fact, into the names I needed for my ornaments. So I went back to my bits of text fabric, now getting quite small and obviously used, in search of individual letters. I tried to change fonts in mid-name for that ransom-note look, although a couple of people got their whole name in the same type. I ran out of some capital letters before I ran out of people, but otherwise had no trouble. I constructed the ornaments exactly as I had constructed the second quilt, striped fabrics, raggedy thread ends and all. The backs came from some fabric I found online with big numbers for the year. I hope all the ornaments are happy on their respective trees today, and that all the recipients are even happier. Same goes for all my readers. Merry Christmas! I wrote earlier about how a couple of past daily art projects are languishing in bags, never having been put on display (and probably never going to be). Here's one that got a bit farther. In 2012 I did hand-stitching every day (you can see all the squares here). I decided to sew them together seven squares across to resemble a calendar. I made four panels, three months each. It's a good thing I got started on that task early in February, because sewing the squares together turned out to be nearly as time-consuming as making them in the first place, and it was nice to stay up to date. One thing that was satisfying about 2012 was the way the calendar fell -- about as perfect as you can get if you want to assemble neat three-month panels. To begin with, the year started on a Sunday, so panel 1 would have a full row of seven squares across the top. Then, because it was Leap Year, both the the first and second quarters had 91 days, exactly thirteen weeks. That meant both panel 1 and panel 2 were perfect rectangles, with the beginning Sunday at the top left corner and the final Saturday at the bottom right. And panel 3 also started on Sunday with a full row across the top. By the end of September, however, the pattern broke just a bit -- the third quarter had 92 days, lapping over into Sunday. So panel 3 had one orphan square in the bottom row, and panel 4 had to start on Monday, with a gap on Sunday (I used a square of tulle to hold the place). I was pleased that the irregularity didn't show up until the third and fourth panels, so viewers would be surprised. I still haven't decided how to display the panels, if I ever have a chance to do so. It might be nice to hang them out from the wall so the back side is visible too. I like the back side of hand stitching because it proves that the work was done by a human, not a machine. I like the knots and the occasional tangle. I like to see which stitches take up a lot of thread on the back, and which ones barely any. Should that opportunity ever arise, I might sew a tiny tube of tulle across the top of each panel, just wide enough to put a very thin dowel or rod through, and suspend it from the ceiling on fishing line. Or if the venue insists on hanging it on the wall, I might just ask for it to be casually pinned up without a hanging rod. But I'm getting way ahead of myself! For now, I'll probably hang a panel or two in my studio every now and then if a design wall happens to be empty. Daily art -- whatever happened to the bundles? When I wrote last week about my various daily art endeavors, Sandy asked how I ever decided to display my bundles, my weekly art project in 2011. I wish I had an answer. As I made my bundles or packages, I simply deposited them into a big shopping bag in the closet under the stairs with the luggage. My thought was that someday perhaps I could find an opportunity to display them all together. I still think that would be a nifty idea, but so far I haven't found such an opportunity. At the end of the year I did photograph all of the bundles (except from my week at the beach; those bundles were MIA for a year and a half and have only recently resurfaced) but not well enough to make the photos into a little book or anything. an obvious first step would be to reshoot them on a better background than my green cutting mat. 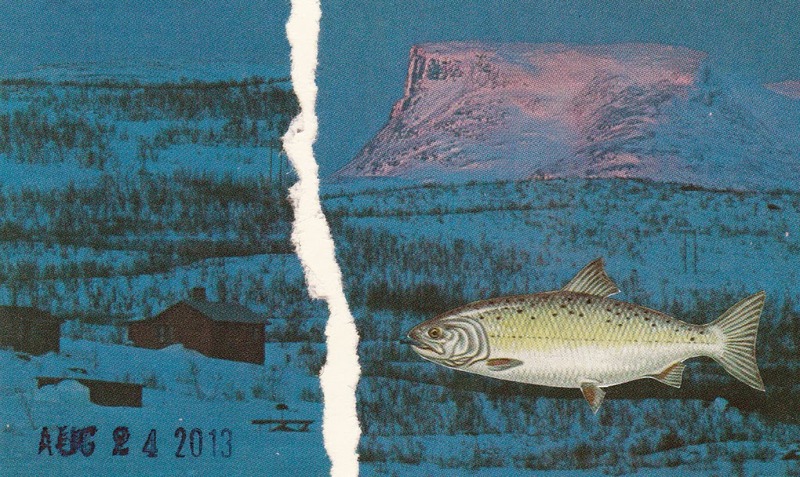 I also have no good answer for my collages, this year's daily art project. They are display-friendly because I chose to use the same size support throughout the year (old library card catalog cards) but I haven't figured out what to do with them. An easy solution would be to mount them in an album but that seems a bit unimaginative. If I ever have the opportunity to show them in public I'd probably go low-tech and simply pin them to the wall. Wouldn't it be nice to be in the High Art Club and be able to just call up your gallery and schedule a show whenever you had a bunch of stuff ready for public viewing? I am still jealous of an artist, Nancy Chunn, who decided to do a daily art project in 1996 (every day she took the front page of the New York Times and annotated/embellished/drew all over it). She had to really rush at the end of the year because her gallery had scheduled a show of the entire year's work to begin on January 11. By the way, her book about the project is magnificent and you can get one on Amazon for 99 cents. First of all, the verdict from my faithful readers seems to be in -- I should keep up with the weekly photo suite. I wrote last week that I wondered whether this project was getting stale, but several commenters said it wasn't. So that's all I need -- I'll keep it up for another year. Other commenters talked about daily art projects in general and how it's so easy to paint yourself into a corner. They're right that it's bad news to commit yourself to a project that turns out to be more difficult than you can handle. Not only do you not finish the project, but your self-confidence takes a big hit from the failure. So whenever you consider a daily art project, you want to give yourself all the breaks -- define the rules in your own favor. Maria asked about how I manage to keep up the daily art when I travel. I know that we love to go places, so I always define my daily art to accommodate that. I have small scissors that are acceptable to airport security, and I'll take just enough cards or fabric squares to get me through my vacation. For collage I stick with what I collect en route, which is always sufficient; you always acquire newspapers, tourist brochures, train tickets and other paper. A small ziplock bag gets me through any trip; less space than a magazine. Linda asked about how to keep it simple. She asked, "I know that I tend to over-complicate things -- trying to fit too much into a piece. Have you any suggestions for keeping a stitching project simple?" Well, one sure-fire way is to keep it small. During my year of hand-stitching daily art I cut four-inch squares of fabric (and knew that a quarter-inch around the edge was going to disappear into seam allowances). There just wasn't enough room to get too fancy, although some days when I was feeling expansive I would put a LOT of stitches into that space. Other days I did very little. In other words, give yourself permission to be minimal. 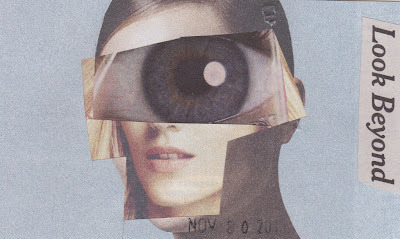 I've found this year in doing collage that some days I will spend a lot of time searching for the perfect image or pasting down a dozen or more bits and pieces. But other times I will find two things that seem to go together and quit while I'm ahead. Another way to simplify is to allow or require yourself to rework certain motifs. For instance, Linda McLaughlin, a fiber artist who has been doing daily art for a long time, spent all of this year just doing circles on one of her projects. I frequently returned to familiar motifs in my year of hand stitching -- circles, spirals, birthday cakes. If I couldn't think of something new and exciting to do, I just did another spiral or another circle. I also allow myself a grace period. Although I have been known to paste up a collage on an airplane or stitch in an airport waiting room, I sometimes have to wait till tomorrow, and built that into the rules. In the year that I took a photo every day, I never missed, but I gave myself leeway to actually post the photos to the blog. So when we spent a month in Germany, and I didn't have remote access to the internet, I waited till we got home to post the pictures I'd taken. Remember, you set the rules, so give yourself the benefit of the doubt and set rules that you will be most likely able to follow. 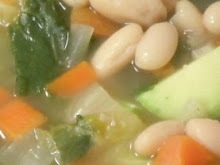 Update: Linking this to Nina-Marie's blog, where you can check out what other fiber artists have been doing this week. Faithful readers of this blog know that I am a lover and practitioner of Daily Art, which I describe as making art regularly (daily, weekly, monthly) according to a self-defined system of rules. I have been doing Daily Art of some sort in all but one of the last 13 years, and the year I didn't left me feeling empty. In fact, in recent years I've been doing multiple Daily Art projects, with a weekly task on top of my daily assignment. I find that I love the challenge of working to specifications and rules; it's no coincidence that I also love sudoku and crossword puzzles. But I mainly find the discipline of making something EVERY DAY to be liberating and exciting. Liberating because you don't have to make something great, you just have to make something. You can experiment and produce a dud and it doesn't matter, because tomorrow you will get to make another one. Exciting because when you do something 365 times you are bound to have some magnificent moments; you are bound to learn, to change, to grow as the year passes. But inevitably as December rolls around, the Daily Art aficionada is consumed with the big question: what shall I do next year? To recap, I'm doing two regular art projects this year: a collage every day, and a weekly "photo suite" of several pictures on a theme. 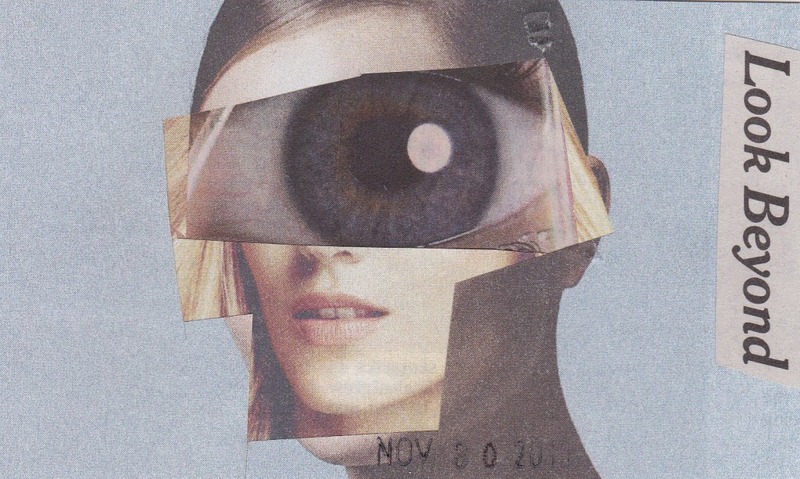 I post the photo suite on this blog every Sunday morning, but the daily collage appears only on my other blog, Kathy's Daily Art. I also post a "Sign of the Week," a series that has been going on since 2010. I tell you this partly because it's what's on my mind right now, and partly because I encourage all my artist friends to consider doing Daily Art of their own. Some of my friends have tried it and hated it, but others have tried it and loved it. I've tried some projects that turned out to be duds and got abandoned quickly (once before the first day's work was ever completed), but I have generally been really happy with this approach. The other day, in fact, somebody asked me whether I feel great relief at the end of the year as a project draws to a close. No, I said, I generally feel bad that it's over. If Daily Art at all appeals to you, I recommend careful thought in setting your rules to accommodate your life. I also recommend a trial period before you commit to a whole year. It's discouraging to embark upon what you think is going to be a year-long project and abandon it in February, but if you only committed to do it for a month and you don't re-up, that doesn't feel bad. I like to start my projects on January 1 but some people prefer to start on their birthday or Bastille Day or just whenever they think about it. Try it -- you might just like it! 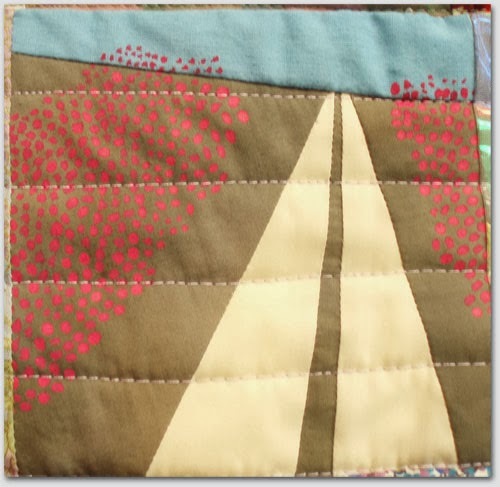 Linking today to Nina-Marie's blog; check it out to see what other fiber artists have been doing this week. Craft. Decorative. Functional. Well made. Words like these are often used to keep objects in their place, carefully segregated from the realm of art. With a painting, you can ignore how it was made and cling to subject matter for meaning; these glass works force you to think about how form and process achieve meaning on their own, without a clear-cut narrative, or a hushed relationship to, say, abstraction. Ultimately, though, a substantial narrative does emerge. It's about discipline, curiosity and risk, and a seductive, volatile, magical medium pushed to extremes. 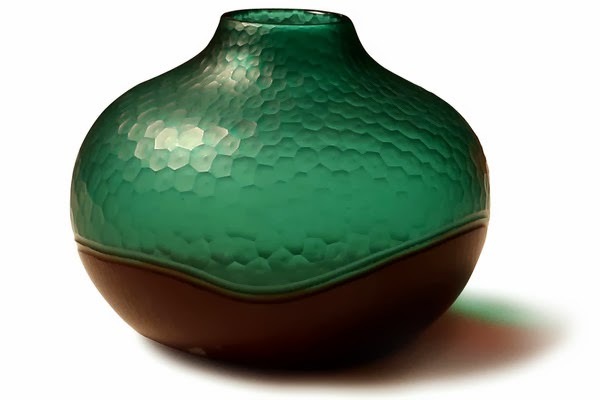 These objects can't help being meaningful, out of sheer force of aesthetic personality. How nice to read such words about craft, from one of the premier art critics in the U.S. It would be nice to read similar thoughts about fiber. I'd be happy if somebody had those thoughts about my work. Last week I wrote about a new piece I've begun in which my pieced fine lines, heretofore always used as separators between larger pieces of fabric, have taken on a new role, simply sewed to each other with no intervening large pieces. Some of the comments left on that post suggested that I must be nuts or masochistic or both, which may have some validity. I'm pleased to report that despite the labor-intensiveness of the construction process, it's going together easily and happily. Here's where it stands now. But this seems like a good time to mention that if you're at all intrigued by pieced fine lines -- that is, if you're a bit nuts yourself -- you might be interested in a workshop that I will be leading at Nancy Crow's Timber Barn next fall. We'll start with the technical aspects of piecing very fine lines (not at all as hard as it looks) and then experiment with different ways of assembling large compositions with fine lines. In my mind I divide the possibilities into two approaches. The first one I call large-to-small, in which you start with a large piece of fabric, then slice it apart and sew the pieces back together with a fine line pieced in between, over and over until you end up with the surface fragmented into lots of smaller bits. The other one is small-to-large, where you start with small pieces and sew them together with a fine line pieced in between, over and over until you get a large expanse. I recently taught this as a two-day workshop, and participants were able to make one small example of each approach. But I'm excited about having a whole week in which to more fully explore the many different ways of using fine lines, not just as separators but to "draw" shapes and figures. I hope that in a week people will be able to move past my own processes and start to find their own voice. The Crow Timber Barn is simply the best workshop facility in the world for making art quilts -- with big work tables and huge design walls for every participant, and an atmosphere that combines serious intent with a lot of fun. I hope a bunch of you will be able to join me next fall for this workshop. Maybe Santa Claus would help you be one of them!